Day 1! I can’t believe my project is finally starting. I’m so excited and now a little scared. Will I be able to make a mosaic every day and do everything else I have to do in a day and have time to sleep? We’ll see. I know that stopping and making a mosaic or doing anything creative is a great way to get a little distance from my “regular” life. It energizes me and helps me to go on. 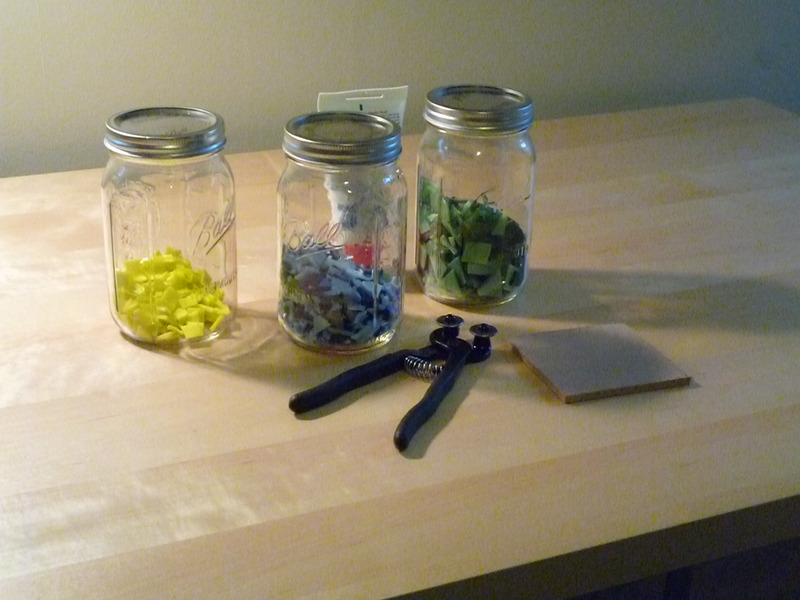 This morning I took out all my supplies and arranged them on my work table so I would be ready to go as soon as I got home tonight. I would have loved to skip work and just create all day. All day I kept remembering that I had to create my first mosaic tonight. It was sweet to think about. 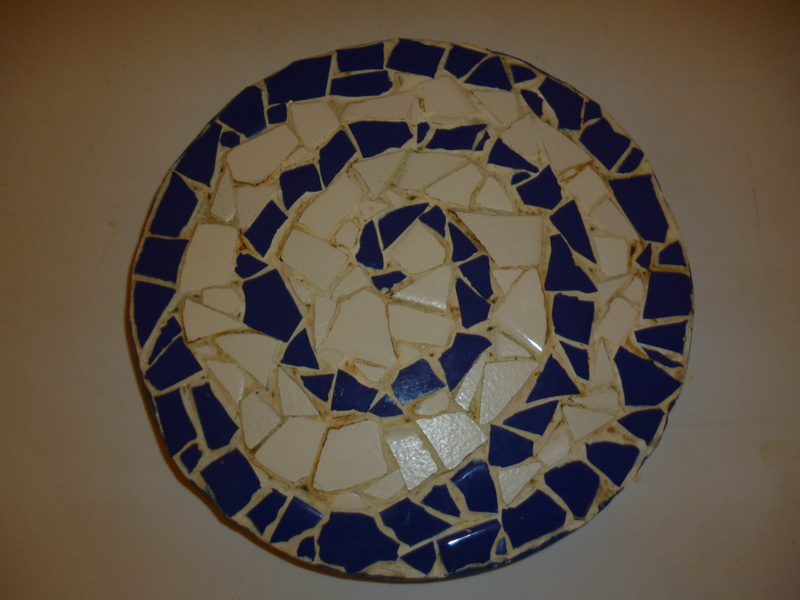 I knew from the start that the first mosaic was going to be a blue spiral. 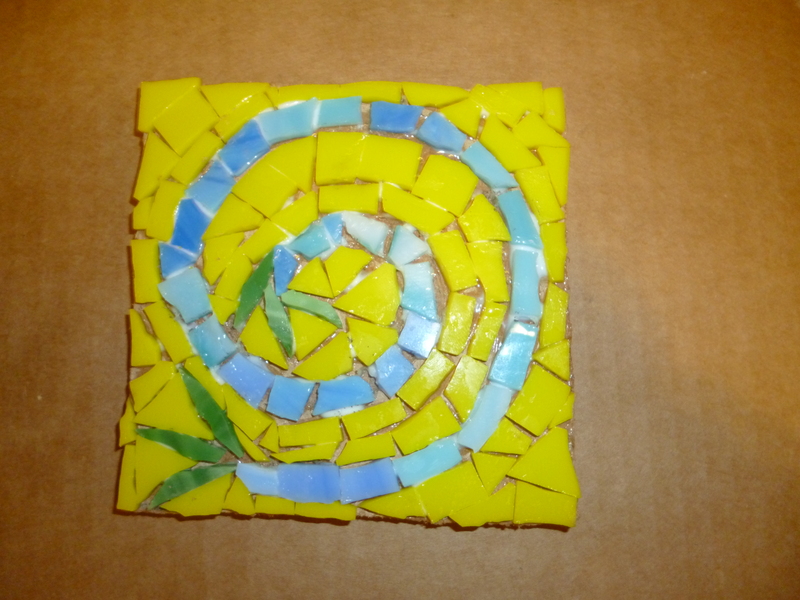 The very first mosaic I ever created was a spiral. I love spirals! I thought it was going to be plain, 2 colors, nothing fancy; but over the weekend I saw the spiral with leaves on it. I was surprised but I have learned to go with the design I see in my head. I thought it was nice with the leaves. I little extra something to make it more interesting. I have no idea where the yellow background came from. It just jumped out at me this morning. As I was working tonight I kept going back an forth between wanted to make a great mosaic and wanting to get it done fast. I reminded myself that if this one doesn’t look exactly like I want it to there’s always tomorrow to try again. That was a great feeling. It took some pressure off so I could just have fun. This project will also be a learning experience with my photography skills. Starting tomorrow I’ll take pictures during the creation but today I just have this one photo of the end result. Tune in tomorrow for Day 2. I’m looking forward finding out what I will create. thanks, I’m so excited to have a buddy on this project!